Post and beam design for developer community. (C)Copyright 2004-2010 Rand Soellner, All Rights Reserved Worldwide. Falcon Cliff Lodge 2 designed by Rand Soellner Architect: residential architect, post and beam design. 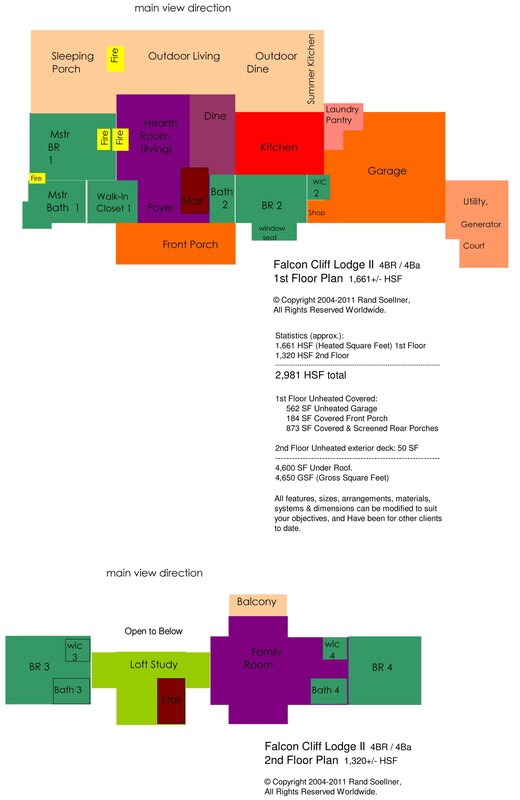 An alternate post and beam design elevation to the orginal Falcon Cliff Lodge, designed by residential architect Rand Soellner. This one has a cupola, large front shed-roof dormer, small shed roof dormer and side-load garage. Poplar bark shingles or cedar shingles (your choice) grace the right side gable pot-out. Random board and batten clad most of the walls (it is economical, looks great and goes up fast). The roof is intended as wooden shingles (either pressure treated #2 southern yellow pine, or cedar). A post and beam design by Rand Soellner under construction. For those of you who may not know, the posts are the vertical elements. The beams are the horizontal components. 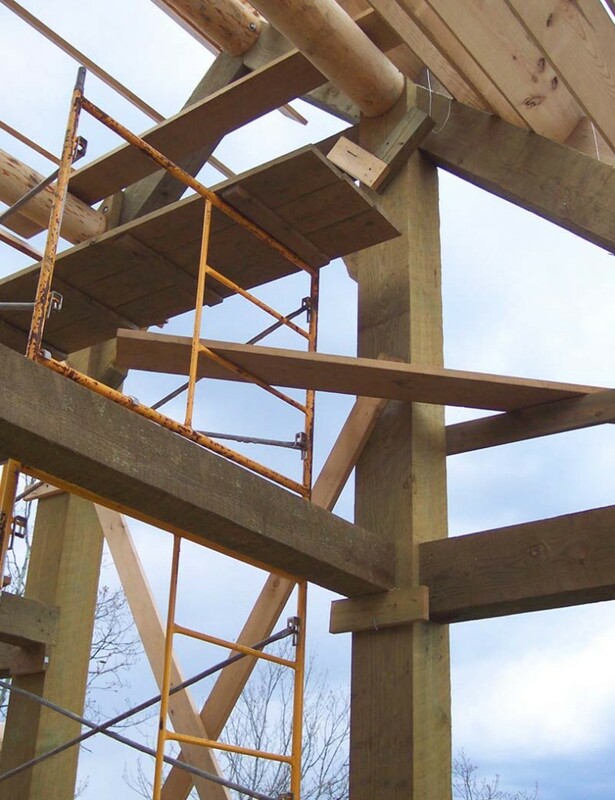 Post and beam design similar to timber frame. Many of architect’s client request post and beam design. A post and beam design is on the minds of many of Rand Soellner’s clients. They often find Soellner by searching the internet for post and beam design and for home architects. The Soellner company prepares quite few home designs each year and nearly all of them have posts and beams. Soellner usually supports his porches with either round or rectangular shaped posts and horizontal supporting elements (the beams). There is a tremendous appeal for the aesthetics of this type of structural system. There is something about the massiveness of the structural elements that goes back to our historic roots, from a time when trees were cut and shaped with broadaxes to form the shelter over our heads. There is a sense of permanence that typical conventional construction cannot deliver. Soellner can provide a post and beam design that is regimented or more freely spaced, providing posts where most logically allowed with respect to the functional requirements of a space. This is actually the key to Soellner’s hybrid approach. He rarely allows any sort of of arbitrary post grid dimension to dictate the dimensions of a room. Rather, Soellner lays out a space according to the lifestyle requirements requested by the homeowners, then locates the posts to relate to that, rather than vice-versa. This is post and beam design dictated by spacial needs, rather than by artificial structural systemization. Although this may sound hard to understand, it really just means that Soellner allows the homeowners spacial needs to set the boundaries of the spaces in which they live rather than allowing structural grids to do this. This results in a post and beam design that is far more comfortable than the reverse approach. 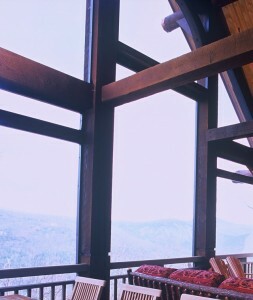 A post and beam design by Rand Soellner, similar to the Falcon Cliff Lodge 2. (C)Copyright 1004-2010 Rand Soellner, All Rights Reserved Worldwide. Blue Ridge Mountain projects are often post and beam design. As a residential architect in the Blue Ridge Mountains, Soellner said he often provides a post and beam design. His clients seem to really enjoy them and the massive scale they give to a project. The Falcon Cliff Lodge II was designed by post and beam architects Rand Soellner. Soellner is a custom home architect living in the southwestern North Carolina area, and serving the entire USA and the world. Soellner also happens to be a mountain homes architect. He also designs houses for flat property in surburban communities. post and beam design, residential architect, cashiers architect, highlands architects, lake toxaway architecture, timber frame, custom home architects, luxury residential architecture, green home, healthy home, log home mansions, boston, atlanta, asheville, hendersonville, glenville, sapphire, whistler, vancouver, burbank, telluride, newnan, jacksonville, nashville, chattanooga.